Around the world, 1.6 billion people depend on forests for their livelihoods, yet forests are being felled at an astonishing rate. Between 2010 and 2016, 3.3 million hectares were lost, often for profits that bypassed local communities. Women, particularly those who are poor and living in rural areas, often depend on forests for fuel, fodder and food. Deforestation for some means spending many more hours each day walking long distances to secure these needs. Their limited ownership of land reduces their capacity to adapt to losses or to make decisions about how land is used. While some have extensive knowledge about traditional practices that are inherently sustainable, this is often excluded from decisions about sustainable ecosystems. When women make up a critical mass of between 25 and 35 per cent of the people in community forestry, their impact is felt. Forest conditions and regeneration improve, and the women themselves gain greater political voice. Souhad Azennoud, A founding member of the agricultural cooperative Ariaf Kissane and renowned as a pioneer of agroecology, is one of more than 200 women to benefit from a project supporting female seed merchants for sustainable development. To combat the impact of climate change, indigenous women of Laramate in Peru have turned to ancestral farming techniques with support from UN Women’s Fund for Gender Equality. In addition to healthier crops and improved incomes for the community, the programme has boosted indigenous women’s participation in public spaces and decision-making. The increasing degradation of land and natural resources caused by climate change is threatening rural women’s livelihoods in Mali. 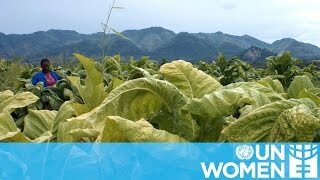 A UN Women programme works with farmers to modernize their techniques, improves their access to information on the latest advances in agriculture and increases the value of their products by teaching them conservation methods. After participating in a UN Women-supported land reform programme that increased Zimbabwean women’s access to farm land and productive resources, Daphne Bayayi, now owns and operates a successful tobacco farms that exports a world-class product onto international markets.